When the winter landscape begins to paint its browns and grays, don’t forget to tuck in some pansies for a burst of color. Pansies, along with their viola cousins, pop up their cheery little faces in late fall and early spring to spruce up hibernating gardens. Pansies are perfect for cool-season containers, and they’re also great for tucking into beds along with spring bulbs such as daffodils and tulips. Unlike most other flowering annuals, pansies thrive in cool weather and die back in summer’s heat. They can be grown from seed or purchased as bedding plants, and they’re planted in fall or early spring and enjoyed until summer. Pansies and violas come in a variety of colors and sizes, so have fun choosing your favorites! The best time to plant pansies is in the fall. In areas with warmer winters, they’ll bloom straight through until spring. In colder areas, they’ll hunker down under the snowfall during the winter and perk back up in spring, larger and more showy than spring planted ones. All pansies and violas can handle mildly frosty weather, but some varieties – known as “winter pansies” – are bred specifically to survive cold winters. There are quite a few winter varieties, including ‘Bingo,’ ‘Icicle,’ and this winter pansy seed mix. When in doubt, the plants with smaller blooms are usually more cold-tolerant than the large-flowering varieties. Climate: Most varieties of pansies can be grown over the winter up to hardiness zone 6. Gardeners in zones 4 and 5 should look for winter pansy varieties and possibly provide some protection during the coldest months. 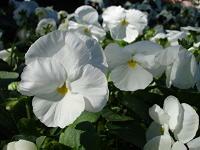 Light: Pansies prefer full sun to partial shade. In colder zones, pansies do better in a warm, sunny planting site. In warmer zones, consider planting pansies near deciduous trees that will provide some cooling afternoon shade once the trees leaf out in spring. Soil: Pansies like well-draining, nutrient-rich soil. Pansies hate to be soggy, especially during the spring thaws, and they need plenty of organic matter to feed the blossoms. If your soil is very heavy and wet, you may want to grow your pansies in containers to keep them from rotting. Water: Like other annuals, you’ll need to make sure your pansies get enough water without saturating them. 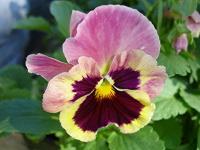 Shop wisely: Choose healthy, bushy pansy plants with plenty of unopened flower buds. Planting time: Plant pansies in September to maximize the growing and blooming season. If you’re planting pansies in spring, set them out about a month before your last frost date. Growing tips: Pansies like plenty of nutrients, so mix in lots of compost and a handful of organic slow-release fertilizer when planting. Space them about 8″ apart. Keep them moist, but don’t over water. Winter care: Gardeners in zone 6 and colder may want to protect tender pansies with a layer of mulch, straw, or evergreen boughs. This is a great way to recycle your Christmas tree! Be sure to remove the protection in spring, about the time you see spring bulbs poking out of the ground. Spring care: When your pansies start growing in spring, give them a haircut to remove spindly winter growth and encourage bushy plants. Fertilizer: In addition to mixing slow-release fertilizer into the soil, you may want to feed pansies again in early spring with a fertilizer specifically formulated for pansies (and cold soil). Deadhead: Pinch or cut off spent blossoms on pansies to encourage more flowering.